The 4 Tunes were probably the leading black Pop vocal group during the 1950s. Their origins can be traced back to a change of personnel in the Ink Spots. This requires a brief review of some events in the mid-40s. 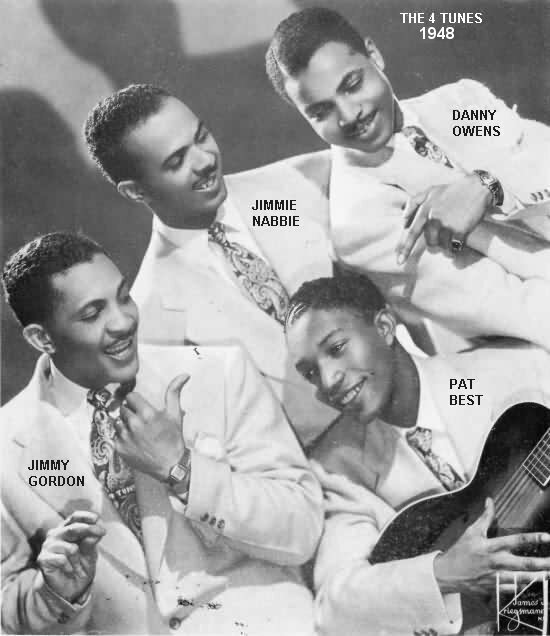 The 1944 Ink Spots consisted of Bill Kenny (tenor lead), Deek Watson (tenor), Bernie Mackey (baritone and guitar; he was temporarily taking the place of Charlie Fuqua, who was in the service), and Orville "Hoppy" Jones (bass). In June 1944, during an engagement in Chicago, Hoppy Jones became ill and the group had to finish a tour without him (Deek Watson filled in on the mandatory talking parts). This had unsuspected ramifications. Hoppy was the conciliatory father figure (nicknamed "the grand old man") of the Ink Spots. Now that he was missing, infighting between Bill Kenny and Deek Watson, which had formerly just smoldered, now flared up unchecked. Deek had been the leader of the group until their 1939 smash of "If I Didn't Care." 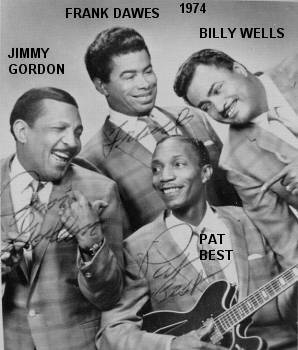 Since then, Bill had firmly established himself in the forefront of the Ink Spots, pushing Deek further and further into the background. Hoppy returned in August, but by then, the damage had been done. After an engagement at the State Theater in Hartford (probably in September 1944), Deek quit. The assertion of Bernie Mackey was that manager Moe Gale had given Bill Kenny a raise at this time, but not Deek or Hoppy. After being edged out of the singing leadership of the hottest black group in the country, this was more than Deek could take. Almost immediately he began putting together his own competing Ink Spots group. Unfortunately, the worst was yet to come. On October 18, 1944, Hoppy Jones (who was 39) collapsed on stage and died after being taken home. It turned out that he had been having cerebral hemorrhages for over a year. Strangely, Billboard reported that Jones was the "last of the original Ink Spots." At the end of October, Deek Watson tried to return to the Ink Spots; Bill Kenny refused to allow him back on stage. This triggered a complex array of legal machinations, which unfolded throughout late 1944 (and paved the way for lawsuits throughout the 1950s and 1960s). Suits and countersuits followed, and courtrooms became the place for memorable, albeit nonmusical, performances. 1. Deek Watson and Charlie Fuqua sued Kenny for $250,000 and the right to get back into the group, as well as to deny Kenny the right to use the name "Ink Spots" until they were reinstated. That battle they lost almost immediately. 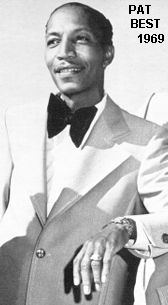 Even though Fuqua was still in the army (stateside), he sued to be allowed back into the group upon his discharge, as well as to be declared a full partner in the Ink Spots. Both Watson and Fuqua wanted to deny Kenny the right to represent himself as the sole owner of the Ink Spots name. 2. Bill Kenny sued Gale for an accounting, charging that Gale took a 50% cut out of the group's earnings, as well as his 10% commission. (Gale said that he paid a lot of the group's expenses, such as advertising, arrangements, publicity, and half their transportation.) Gale also countered that they had signed a new 5-year contract with him just the prior year, indicating that they were satisfied with his services. 3. Moe Gale sided with Deek Watson, and sued to deny Kenny the right to use the "Ink Spots" name if he wouldn't use Watson in the group. It was finally decided to roll all the lawsuits into a single trial, which began in December 1944. On January 8, 1945, the entire litigation mess was settled out of court. As it turned out, Deek was the one who was denied the name; clubs were barred from booking any Ink Spots group not containing Bill Kenny. Watson countered that he was going to form a new group based "on a completely new idea." Gale was to remain as Kenny's manager (his contract had four and a half years to go). Watson and Fuqua retained a financial interest in Bill Kenny's earnings (with Fuqua being paid a weekly salary even though in the army). Finally, Kenny dropped his suit against Gale. 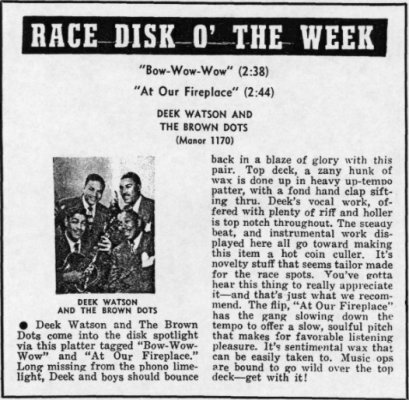 Around November 1944, Deek had started appearing with a new group, which he called the "Ink Spots." They consisted of high tenor Joe King, bass Jimmy Gordon, and an unknown fourth member, who was probably a baritone. 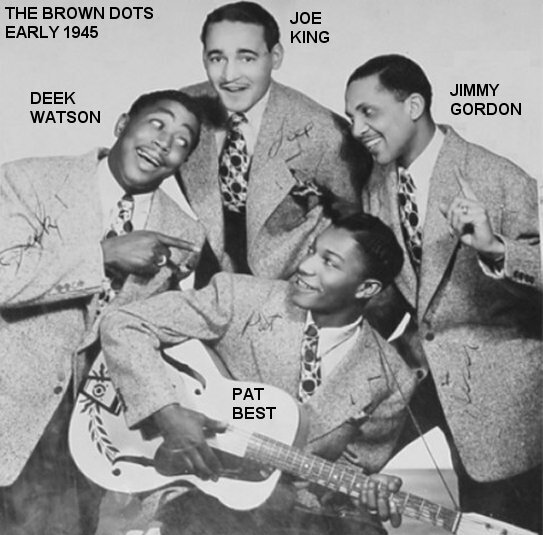 At the time Deek's "Ink Spots" became the "Brown Dots," the unknown baritone departed, to be replaced by baritone/guitarist William "Pat" Best. A bartender told Deek about this kid who fooled around in Central Park, singing and playing the guitar. Pat didn't think he could either sing well or play the guitar ("I only knew two chords"), but Deek was persistent. This, coupled with the fact that Pat was having some squabbles with his wife at the time, led to his joining the Brown Dots. He first met Joe King and Jimmy Gordon at Moe Gale's office. The Brown Dots' first three engagements began on February 1, 1945, when they played the Club Plantation in St. Louis (for a reported $2000 a week). Pat Best says of that show: "We were terrible. They threw things at us and booed us off the stage. We'd only rehearsed for a couple of weeks and I only knew two chords on the guitar." (In spite of this, a March 3 article said that they "have been acclaimed by critics and patrons alike.") From there they traveled to Smith's Hotel in Baltimore, and then to the Apollo Theater in early March. This is the first theatre date of the new quartet formed by Deke [sic] Watson, one of the original members of the Ink Spots, who bowed out of that combo last fall after drawn-out litigation. One of the sparkplugs of the Spots, Watson is doing a man-sized job of carrying the new group in its early stages. And the result is that the quartet, as it works here, shows very good possibilities. When caught [when the reviewer saw the show], the Dots were still a long distance from big time, however. Their harmony was a bit ragged, the tenor voice [Joe King's] was inaccurate and badly controlled (due to illness, it's said), and their selection of tunes ("Little On Lonely Side," "I'm Making Believe," "Java Jive") wasn't good in view of Watson's past association with the Ink Spots. However, as cited above, the very animation of Watson and brief flashes in the combo's work seems to indicate future strength. When laid out several months ago, it was said Watson's idea was completely different from the Ink Spots pattern. It isn't, and the similarity to the Spots isn't wise. Watson uses a high tenor much in the way Billy Kenny works with the former act. This isn't as bad as the insertion of a spoken bridge in one song, a chore handled for the Spots by the late Hoppy Jones, whose voice and delivery is difficult to copy. It shouldn't even be attempted. Probably at that show, they received an offer of a recording contract from Irving Berman, owner of Manor Records' (located at 162 Prince Street in Newark, New Jersey). 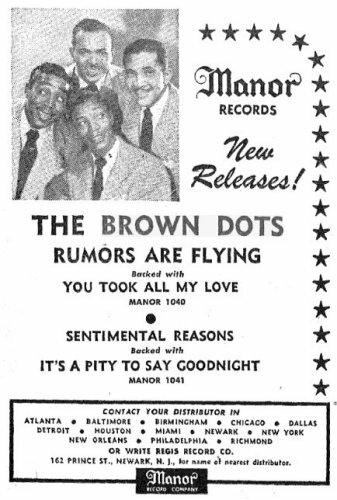 In an ad in the March 17 trades, Manor touted songs by the Brown Dots as "to be released." 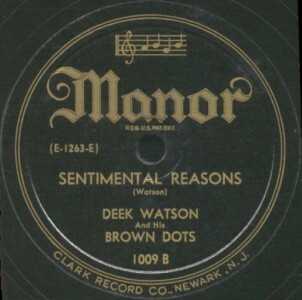 The Brown Dots initially recorded four songs for Manor: "Let's Give Love Another Chance" (led by Deek), "Thirty-One Miles For A Nickel (Subway Serenade)" (also Deek), "Sentimental Reasons" (led by Joe King), and "You're Heaven Sent" (also Joe King). Their first release, in May 1945, was "Let's Give Love Another Chance"/"Thirty-One Miles For A Nickel (Subway Serenade)." "Sentimental Reasons" - later recorded as "For Sentimental Reasons" and "(I Love You) For Sentimental Reasons" - was a poem that Pat had written. "Way back when I was in elementary school, I liked to write poems. Like I'm talking to a little girl. When I got older, I put a melody to it." 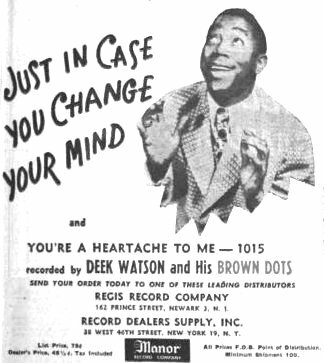 Once they decided to record it, however, Deek saw something in the tune and the label only has his name on as writer (when the Brown Dots re-recorded it in September of 1946, both Pat's and Deek's names appeared on it; however, a re-release of the original finally credited Pat alone). The song was released in the summer of 1945 (backed with "You're Heaven Sent") and didn't seem to be going anywhere. One day, however, Pat got a call from publisher Moe Levy, husband of Maxine Andrews (of the Andrews Sisters). Moe (who, along with his brother, Lou, owned Leeds Music) told him that he'd heard the song and "the whole world was going to sing it." Pat therefore sold him the rights to it for $2500 (a goodly sum in those days); Levy eventually transferred the rights to his granddaughter. Well, maybe the whole world wouldn't sing it, but an awful lot of people would. There were hit versions in 1946 for Nat "King" Cole and Charlie Spivak. 1947 saw charters by Eddy Howard, Dinah Shore, Ella Fitzgerald, and Art Kassel. Over the years, it's also been done by (among others) Smiley Lewis (1954), the Rivileers (1954), Sam Cooke (1958), Jesse Belvin (1959), the Voices Five (1959), Donnie Elbert (1960), the Cleftones (1961), the Spaniels (1961), Marvin Gaye & Mary Wells (1964), Rufus Thomas (1971), and James Brown (1976). It was a long battle, but Pat finally regained the rights to the tune. On May 27, Deek returned to Indianapolis when the Brown Dots appeared at the Sunset Terrace. Also on the show were Savannah Churchill and Luis Russell's Orchestra, featuring violinist Milton Buggs as vocalist. 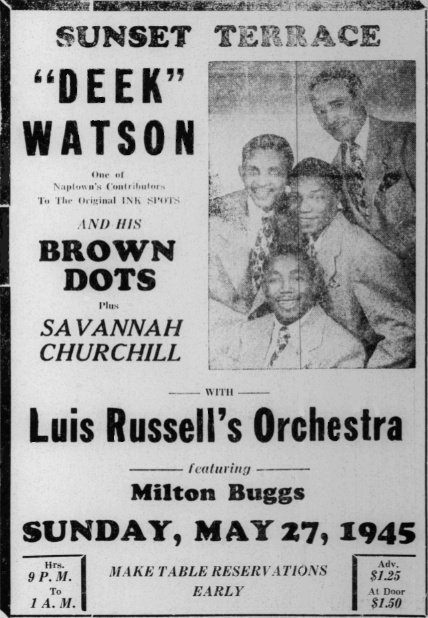 In mid-June 1945, the Brown Dots were at Chicago's Regal Theater, along with Marva Louis, Savannah Churchill, Jelly Roll & ZuZu, and Luis Russell's Orchestra. They next went down to Tampa, Florida, where a friend told Jimmie Nabbie that the Brown Dots were looking for a tenor lead. Since Nabbie was a fan of the Ink Spots, he knew all their songs and was hired after an audition. Jimmie Nabbie had graduated from Bethune-Cookman College in Daytona Beach, Florida. Although he wanted to be an operatic tenor, in 1939, blacks weren't being hired by the Metropolitan Opera, regardless of talent. Jim then turned to Pop singing, forming the Orange Blossom Singers. The group broke up in 1941, when Jim found himself army-bound. With his discharge in late 1944, he started looking for a singing job. He auditioned for vocalist with the Jimmy Lunceford Orchestra, but Lunceford hired the Trenier Twins (Cliff and Claude) instead. After Nabbie joined, Manor started recording the Brown Dots in earnest. In November 1945, they issued "Just In Case You Change Your Mind"/"You're A Heartache To Me." Beginning December 7, they spent two weeks at the Bali Club in Washington, D.C. On the 21st, they began a week at the Apollo Theater, along with Benny Carter and Butterbeans & Susie, followed by a week at the Fans Theater in Philadelphia. Then, it was on to Newark's Panda Room, where they appeared for at least six weeks. In January 1946 Manor released the calypso novelty "That's What She Gets," backed with "Escuchame." The following month saw "Patience And Fortitude," coupled with "Is It Right." In the spring there was "Satchelmouth Baby," paired with "Surrender" and "If I Can't Have You"/"I'm Loving You For You." The results of a poll taken by the Chicago Defender (published on April 20, 1946) had the Brown Dots as the seventh most popular "specialty artists" (behind the King Cole Trio, the Ink Spots, the Mills Brothers, the 4 Vagabonds, the Charioteers, and the Golden Gate Quartet). Over 100,000 readers had sent in ballots. By June 1946, the Brown Dots had two coast-to-coast 15-minute radio programs on the American Broadcasting System network - one at 10:15 Saturday mornings and the other at 6:30 on Sunday evenings. In addition, in July, they became part of the cast of the Eugene Baird show (Sunday nights, 6:30 on ABC). 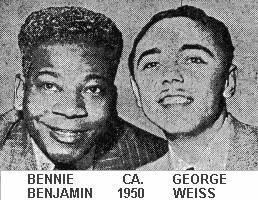 On their July 13 broadcast, the Brown Dots honored Bennie Benjamin, who co-wrote their "Surrender" with George Weiss. (Benjamin was that rarity, a black songwriter who belonged to ASCAP.) Other of his songs that they performed were "When The Lights Go On Again" and "I Don't Want To Set The World On Fire." In August, Manor issued the pretty "Please Give A Broken Heart A Break," backed with "Well Natch." 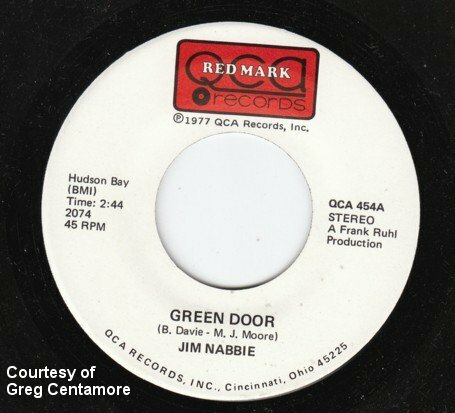 September saw two more records released: "Rumors Are Flying" (another Bennie Benjamin/George Weiss composition)/"You Took All My Love" and a re-sung version of "For Sentimental Reasons" (led by Jimmie Nabbie) with "It's A Pity To Say Goodnight" on the flip. September 1946 almost brought a premature end to the Brown Dots. Deek was at the wheel in Paterson, New Jersey, paying more attention to the scenery than to the road. The car went off the road and down a steep embankment. Pat Best was thrown from the car, but all escaped unhurt. I guess the $250 damage bill was quite huge for the time. In October 1946, they were recruited to replace the ailing Marva Louis in the movie Boy! What A Girl! 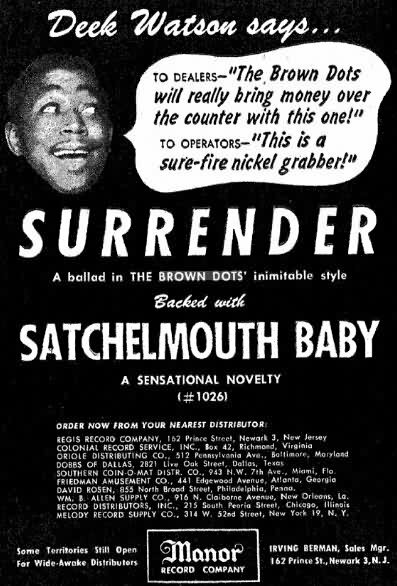 (in which they sang "Satchelmouth Baby" and "Just In Case You Change Your Mind"; the movie also featured the Slam Stewart Trio, Al Jackson, Warren Patterson, and Tim Moore [as the "girl" of the title]). They also appeared in Sepia Cinderella that same year (doing "Long Legged Lizzie" and "Is It Right?"). Deek mugged his way through both movies, and even had a speaking part in Sepia Cinderella. Somehow, though, Deek was always having personality clashes, a pattern that would last throughout his entire career. In late 1946, things got so bad that Jimmie Nabbie, Pat Best, and Jimmy Gordon recruited a fourth member, Danny Owens, from Newark, introduced to them by Manor owner Irving Berman. 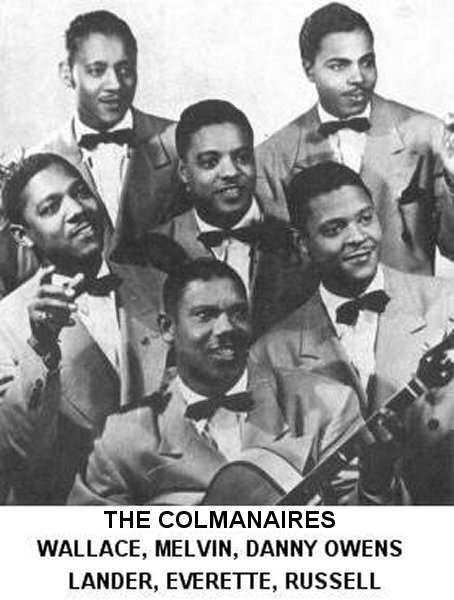 (Owens had been with the Colemanaires, and also with former Ink Spot Cliff Givens, in the Southern Sons/Melody Masters, who recorded for Apollo. The Brown Dots (with Owens in place of Deek) called themselves the "Sentimentalists" (after "For Sentimental Reasons") and started recording for Manor also. The one thing they neglected to do was tell Deek; they first wanted to see if they could make it on their own. In November and December 1946, Manor released 6 records by the Sentimentalists. Two of them were Christmas discs (done along with a 30-member choral group directed by Donald Haywood); one was a backup to Savannah Churchill (something they'd do many times in the future); and the remaining three were R&B offerings. These releases coincided with Manor's move to New York City (first to 2061 Broadway, then to 313 West 57th Street). Please see the discography for all releases from here on; they won't all be mentioned. The guys had a long association with Savannah Churchill, collaborating on around two dozen songs. 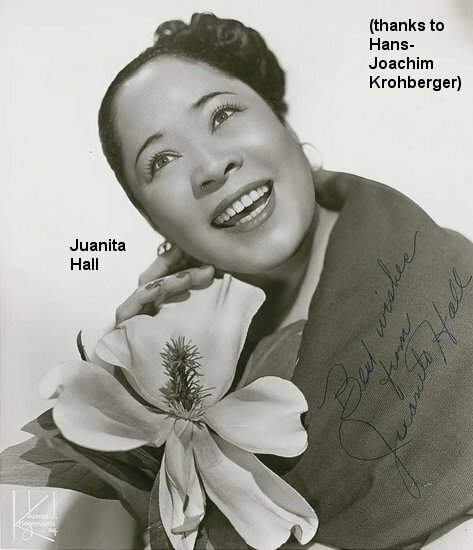 Her musical origins were in gospel, but she later switched to a jazz and blues vein. Their first pairing was on "I Want To Be Loved," which made the top five R&B tunes of 1947. They also had hits in 1948 with "I Want To Cry" and "Time Out For Tears." In all, it was a good union. What happened in the next couple of months is a bit murky. The Brown Dots were part of the show at the Rhumboogie Club in Chicago that began on Christmas Eve. Boxer Joe Louis had just bought and refurbished the club and this was its opening show. Also on the bill was Valaida Snow. Deek did a single act at the Club Riviera (St. Louis) in January 1947, but there were still some commitments to be fulfilled. For example, when the movie Boy What A Girl was released, it was a smash in black-oriented theaters. By April, some of the acts in the film, including the Brown Dots, were part of a stage show traveling through the South and appearing at the theaters screening the film. The last gasp of the original Brown Dots may have been at the Apollo the week of May 9, 1947, when they appeared along with the Buddy Johnson Orchestra (with Ella Johnson, Annisteen Allen, Paul Breckenridge, and Bull Moose Jackson), the Edwards Sisters, and Pigmeat Markham. In spite of the impending demise of the Brown Dots, Manor kept on releasing their records: "How Can You Say I Don't Care"/"Long Legged Lizzie" in December 1946; "I Don't Know From Nothing Baby"/"Shout, Brother, Shout" in February 1947; and a reissue of "That's What She Gets" in July 1947 (its flip was "Why You No Knock" by Benny Davis). When Deek finally found out that he was being left behind, he first tried a single act (appearing at the Club Riviera in St. Louis in January 1947) in between Brown Dots' final appearances. Then, he opened up the "Bow-Wow Record Shop" on Seventh Avenue in New York (reported in June 1947). In August 1947, it was being hinted in the press that the Brown Dots were history. Well, yes and no. Over the summer, Deek formed another Brown Dots group, about which little is known. They first cut some sides for Majestic, in late 1947: "I've Got The Situation Well In Hand"/"Pray For The Lights To Go Out." These were released in March, 1948. Then it was back to Manor, where they had four records, one each month, beginning in February 1949: "As Tho You Don't Know"/"Darktown Strutters Ball," "Bow-wow-wow" (one of Deek's catchphrases)/"At Our Fireplace," "After Awhile"/"If I Could Be With You" (backing Gwenn Bell on these two), and "My Bonnie Lies Over The Ocean"/"You Better Think Twice." 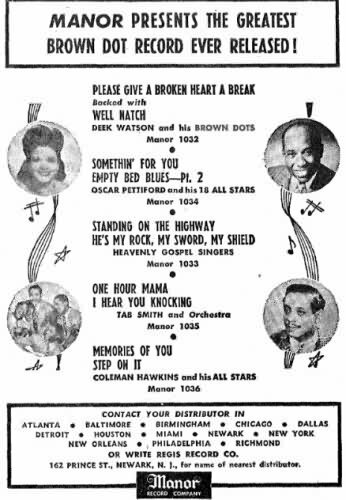 In the February 26, 1949 issue of Billboard, it was announced that Manor had signed the Brown Dots to a five-year contract. Something happened, however, and there were no Manor releases after May of that year. On April 9, "Deke Watson and his Brown Spots" appeared at Prospect Park Pavilion in Mansfield, Ohio, as part of the entertainment for the Clear Fork Riding Club. In mid-1949 they recorded "Strange As It Seems"/"Saturday Night Function" for Bob Shad's Castle Records as "Deek Watson and the 4 Dots." For some reason, the record was reissued, on a 45, around 1952. Note that only the Castle and Manor sides are group recordings. Even though the Majestic and Varsity sides say "Brown Dots," you only hear Deek's voice. It's possible that the group consisted of both instrumentalists and singers. In May 1949, Deek opened at the Cafe Society (in Greenwich Village). No mention was made of the Brown Dots, but for reasons not specified, his act closed the same night. Nothing to do with his group this time, but Deek was in another car crash on July 4, 1949. This time, he suffered a broken rib in a three-car crash in Freeport, Long Island. He was listed as the leader of the Four Brown Dots. In June 1957, he'd face drunk driving charges in Chicago. Around 1950, Deek released some solos on the Brown Dot label ("I've Loved You So Long Baby"/"The Devil Beating His Wife [sic]"). 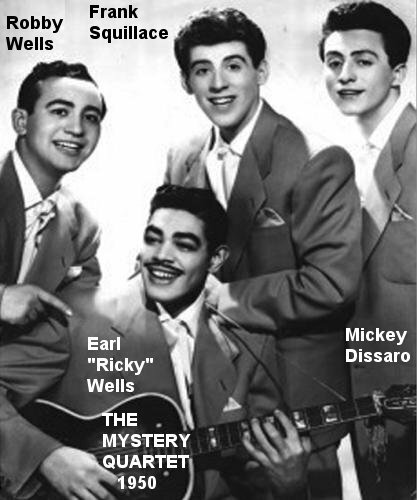 It looks like the second Brown Dots group had broken up by the fall of 1949, since Ricky Wells was appearing with the Mystery Quartet, at Philadelphia's Little Rathskeller, as early as December 1949. In late December 1950, Deek was at the Airport Inn (Troy, New York) as a special guest star "... visiting his friends, the Jive Bombers" (who were regulars there). Aside from singing, Deek had an odd venture. In mid 1952, he put together an act that traveled the country. It consisted of him as a "disk jockey," interacting with and interviewing three-foot high marionettes that looked like famous artists of the day: Lena Horne, Billy Eckstine, Louis Armstrong, Ella Fitzgerald, Cab Calloway, Eddie "Rochester" Anderson, Louis Jordan, and the Ink Spots. I don't know who supplied the voices for the puppets, but between "interviews" he'd play the records of the real artists. In early 1947, the Sentimentalists hit a snag: bandleader Tommy Dorsey contacted them and asked them to stop using the name. 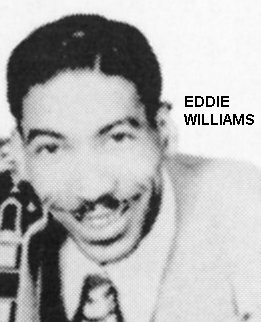 He was known as "The Sentimental Gentleman Of Swing," and he had recently employed a female vocal group called the Sentimentalists. 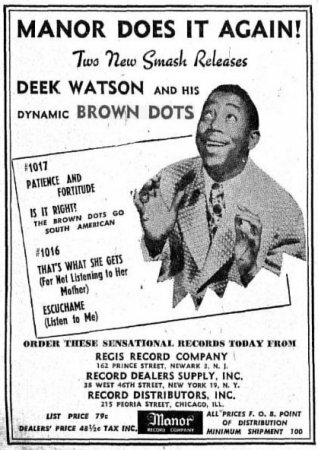 (However, they'd left Dorsey in April 1946 and were now appearing on radio as the Clark Sisters, so the Brown Dots felt justified in using the name.) But Dorsey was nice about it, so the guys decided to honor his request. Since all they had left were four tunes that they hadn't yet recorded, they changed their name to the "Four Tunes." (Although this story sounds like one of the apocryphal tales of the Ink Spots, Nabbie swore to its authenticity.) Manor reissued all their Sentimentalists recordings as by the Four Tunes. Probably because they still had some Brown Dots obligations to fulfill in the first several months of 1947, Manor didn't release anything by the "4 Tunes" until July, by which time Deek and the guys had finally parted ways. 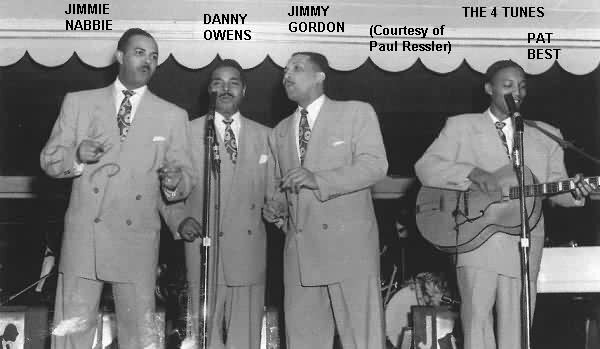 Even though the Sentimentalists had held three sessions in late 1946, the Brown Dots were still in existence and Danny Owens continued to appear and record with the Southern Sons/Melody Masters, whose last Apollo session was in March of 1947 (they broke up soon after). All throughout 1948, Manor kept churning them out. 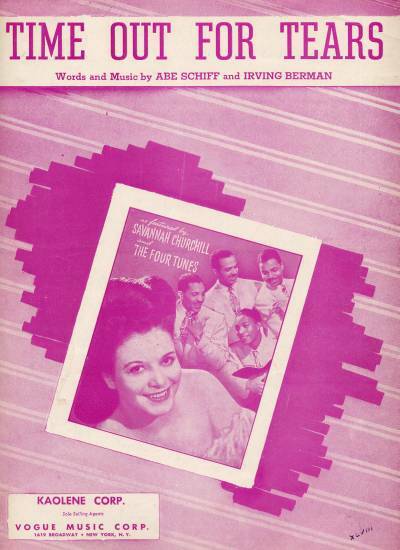 Both on their own and behind Savannah Churchill, the 4 Tunes had ten records in 1948. This included two releases on Columbia, which were Manor masters. Also in 1948, the 4 Tunes were on a television transmission on the Dumont TV Network. It wasn't an actual program in the modern sense of the word, but it did go out to anyone who owned a TV set. 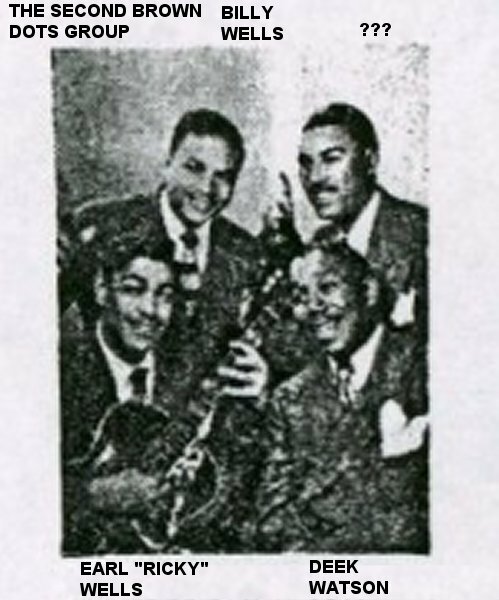 On June 11, 1948, the 4 Tunes, along with Savannah Churchill, began a week at the Apollo, along with Eddie "Cleanhead" Vinson and Andy Kirk. There were lots more Manor releases in 1949, including a reissue of a couple of old Brown Dots tunes ("Let's Give Love Another Chance"/"Just In Case You Change Your Mind"). In the spring of 1949, the 4 Tunes left Manor and switched to RCA Victor, at which time they briefly added pianist Ace Harris, who had been the pianist/arranger for the Ink Spots in 1941 and 1942. Manor would release one more record by them ("Someday"/"Karen Lynn"), before changing its name to Arco. "Karen Lynn" was a homage to Irving Berman's baby daughter (also mentioned in Savannah Churchill's "My Baby-Kin"). There would be more records by the 4 Tunes on Arco, but they were all re-releases (and, in the case of "You're My Love" and "Don't Blame My Dreams", they're old, previously-unreleased masters). While Savannah Churchill was still recording for Arco, it's unlikely that the 4 Tunes backed her up on any new recordings. The 4 Tunes never really had a contract with Manor, so, in order to try to get some distribution and royalties, they switched over to RCA. However, the scheme backfired, because Manor successfully sued RCA, which ended up paying out all their royalties to Manor. In early 1950, the 4 Tunes appeared on Arthur Godfrey's Talent Scouts singing the not-yet-recorded "Cool Water." While they won, there was an unexpected glitch: because his pick made too much noise, Pat had to play his guitar with his thumb, which became bloodied from lack of calluses. Their prize was a week's worth of appearances on Godfrey's daily radio show, which, presumably, led to some bookings. 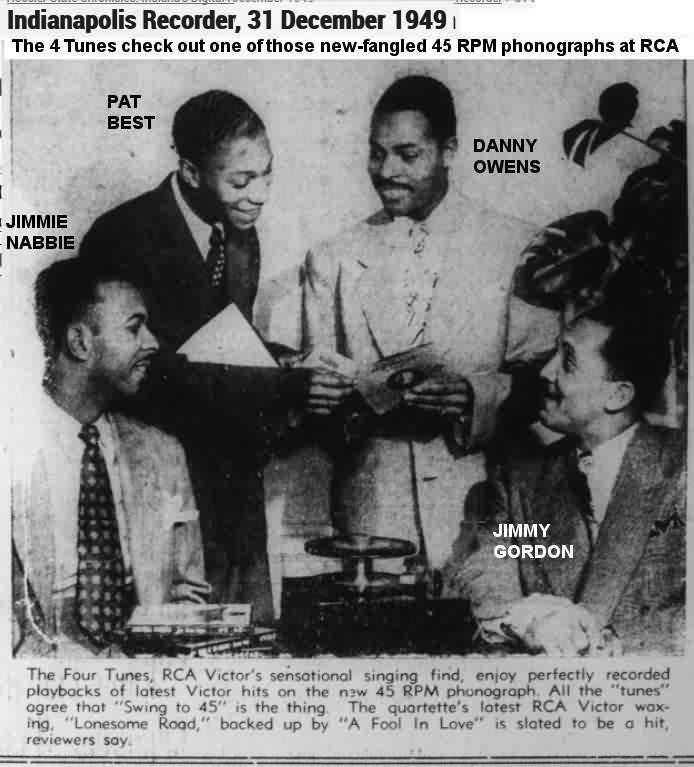 On RCA Victor, the 4 Tunes had 20 some records released between May 1949 and November 1953. These included "Careless Love," "My Last Affair," "The Lonesome Road," "I'm In The Mood For Love" (backing Juanita Hall), "Am I Blue," "Kentucky Babe," "Do I Worry," "Cool Water," "The Last Round-Up," "May That Day Never Come," "I'll See You In My Dreams," "I Don't Want To Set The World On Fire," "Don't Get Around Much Anymore," and "Water Boy. There were also two backups to old friend Savannah Churchill: "I Don't Believe In Tomorrow" and "It's No Sin."" The polished style of the 4 Tunes was the product of their training, experience, dedication, and discipline. Their songs were carefully selected and arranged. Their first arranger was pianist Ralph Herman, who was the youngest member of Paul Whiteman's Orchestra. They also worked with Howard Biggs (whose most famous association was with the Ravens). A February 9, 1952 article in the Afro-American that dealt with the death of Reverend John S. Miller, mentioned that he'd raised two of the Wells brothers, Earl (Ricky) and Aloysius. The strange thing is that Earl was, it said, a member of the 4 Tunes (and it seemed to be speaking in the present tense). While brother Billy Wells would join them in a couple of years, no one ever mentioned to me that Earl had sung with them. It's possible that they mixed up the Brown Dots and the 4 Tunes, but it's hard to see how that could happen five years down the line. In mid-1953, they once again changed labels (since they weren't making any royalties from RCA). This time they went to Jerry Blaine's Jubilee label, where they achieved their greatest popularity. 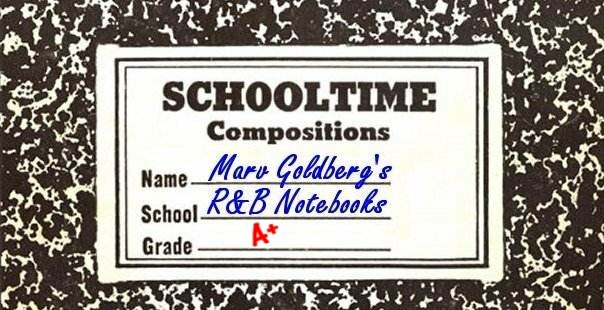 Their first Jubilee recording, "Marie," was released in September, and reached #2 on the R&B charts (#13 Pop). This Irving Berlin tune had been a #1 smash for Tommy Dorsey (Jack Leonard on vocal) back in 1937. ("Marie" was such a big hit that the purely R&B Dominoes and Larks were pushed to sing in the same kind of Pop mold.) Their next Jubilee release, "I Understand Just How You Feel" was an even bigger hit, climbing to #6 on the Pop charts (#7 R&B). 1954 saw two releases on the Kay-Ron label. These were old Manor cuts (although different takes). Two of them were backups to Savannah Churchill ("Savannah Sings The Blues" and "I Want To Be Loved"). The other two were "Just In Case You Change Your Mind" (which was actually by the Brown Dots) and "I Understand" (which was presumably released to confuse record buyers into thinking it was the same song as the current "I Understand Just How You Feel"). On Jubilee, the 4 Tunes were primarily a Pop group (although they did turn out something called "Rock N Roll Call"). Their output included "Don't Cry Darling," "L'amour, Toujours L'amour," "I Sold My Heart To The Junkman," "Time Out For Tears," "You Are My Love," "Far Away Places," "Dancing With Tears In My Eyes," "Sayonara," and "A Little On The Lonely Side." The 4 Tunes appeared for a week at the Apollo Theater (beginning April 2, 1955), along with Red Prysock's Orchestra. 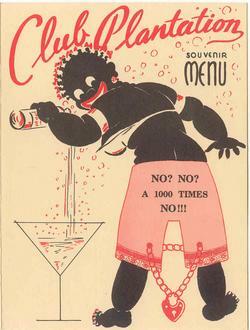 They played both the black theater circuit and also many white clubs. When they were on a tour with Joni James, she asked Jimmie Nabbie to write a song for her. The result, "You Are My Love," was her big hit of 1955 (which the 4 Tunes covered). In 1955, the 4 Tunes were booked into the Hacienda in Las Vegas on a handshake, and stayed for eight years. 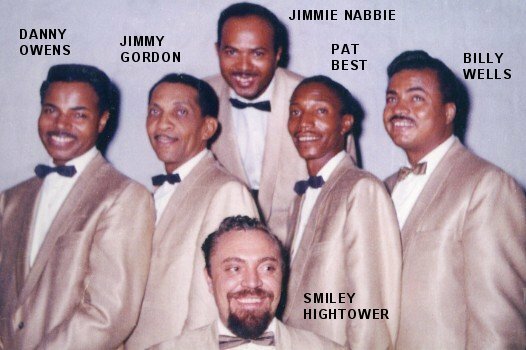 Other members, added at the time, were Smiley Hightower (guitar and bassist) and Eddie Williams (bassist; formerly of Johnny Moore's Three Blazers). Also, tenor Billy Wells (from Deek's second Brown Dots group) was hired so that each of the other members could go on vacation on a rotating basis. In September 1956, probably to commemorate the first anniversary of the death of James Dean, the guys released "The Ballad Of James Dean," a song that had been cut by Dylan Todd on RCA back in March. The 4 Tunes stayed with Jubilee until 1957, and were its second most prolific group (after the Orioles). Pat couldn't remember why the 4 Tunes decided to leave Jubilee. In late 1959, there were two releases on Crosby (a Las Vegas label that Jimmie Nabbie partly owned): "Never Look Down"/"Don't You Run Away (And Leave Me)" and "Twinkle Eyes"/"Starved For Love." 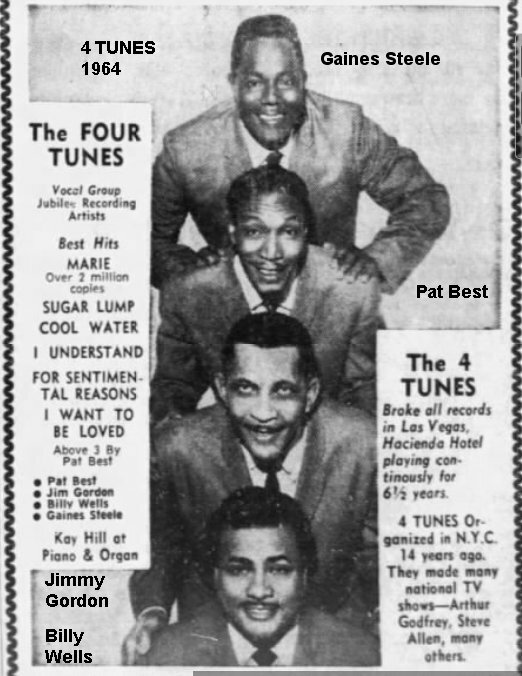 Jimmie Nabbie, mainstay of the group for about 15 years, left around early 1961. He'd have solo releases on Carlton, RPI, and QCA (see discography). In the later 60s, he joined an Ink Spots group to come full circle; he would remain with them until his death. Billy Wells was tapped to fill Nabbie's place. Danny Owens also left, around the same time as Nabbie, and tenor Gaines Steele was brought in to replace him. Steele, younger brother of gospel great Silas Steele, sang with Detroit-area gospel groups and a West Coast Ink Spots group, as well as the Kuf-Linx on Challenge. There are Danny Owens releases on M-G-M and Imperial (from 1959 through 1962), but I'm not sure if this is the same singer. According to a 1992 Sequel CD that contained all their Jubilee recordings, over the summer of 1962, the 4 Tunes returned to Jubilee for a 3-song session from which nothing was released. The songs were: "Love Is Calling," "You Don't Love Me No More," and "Come To Me." Frank Dawes (tenor and piano) was then brought on board, as the same kind of utility singer that Billy Wells had been. 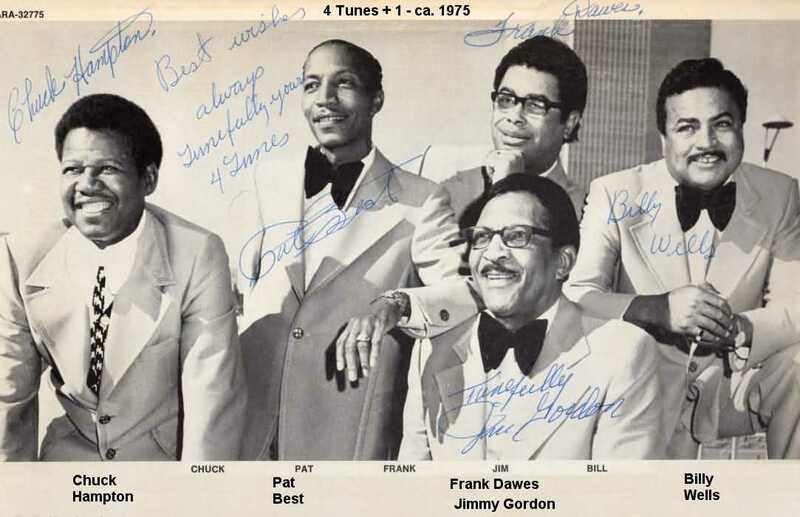 The group was now: Pat Best, Jimmy Gordon, Gaines Steele, and Billy Wells, with Frank Dawes as the utility voice. There was a single release on Robin's Nest (as the "4 Tunes And One") in 1962: "I Have Been Waiting"/"Only In Memories." Billy Wells led "I Have Been Waiting," with Pat Best fronting the flip. Sometime in the 60s, the Four Tunes Plus One backed up Randy Hall on "Pearly Shells"/"Anytime," released on the Canterbury-Hall Enterprises label. The recording career of the 4 Tunes wound down with an LP on the ARA label in 1969 (which not only contained a version of "I Love You For Sentimental Reasons," but also "Whole Lot Of Shaking Going On." 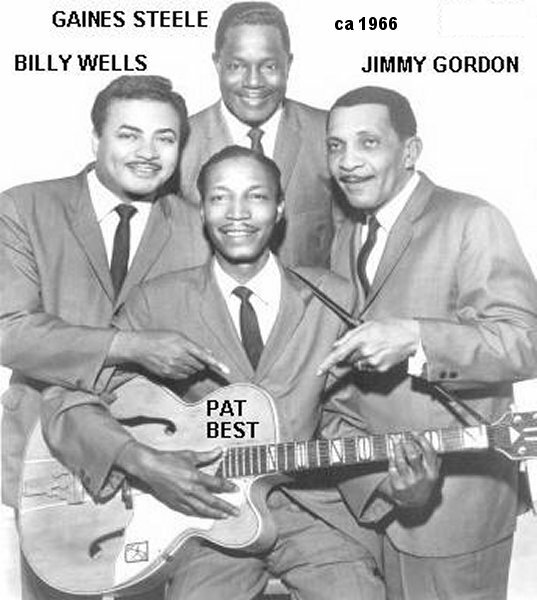 The personnel were: Pat Best, Jimmy Gordon, Billy Wells, Frank Dawes, and Chuck Hampton (drums and vocals). Sometime in the 80s, Billy Wells left for medical reasons and was replaced by a tenor named Andre Williams. Pat Best, Jr. was also added, as a guitarist, for a few years. Pat Best and Jimmy Gordon kept the 4 Tunes going until about 1998 (as the "Tunes Plus One"). 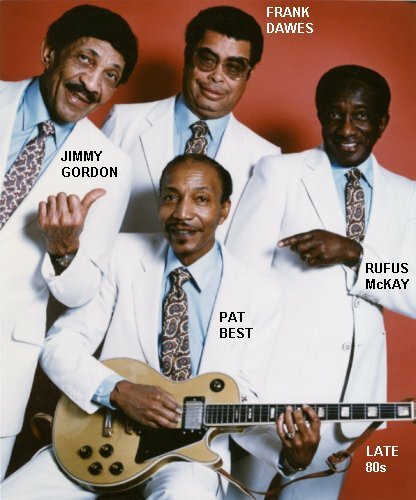 When they played their last engagement (in Carson City, Nevada), the members were Pat Best, Jimmy Gordon, Frank Dawes, LaRue "Rufus" McKay (a tenor who'd replaced Andre Williams about 10 years previously; he'd been in the Red Tops on Sky around 1958), and Chuck Hampton. Time has taken its toll on the Brown Dots/4 Tunes: Deek Watson died in 1969; Jimmie Nabbie passed away after double bypass surgery in 1992; Jimmy Gordon is gone too. Pat wasn't sure about Danny Owens. Pat Best, who was always so delightful to talk with, passed away in October 2004, at age 81. While the Brown Dots will always be associated with "For Sentimental Reasons" and the 4 Tunes with "Marie" and "I Understand Just How You Feel," they turned out an impressive body of work over a 24-year recording career. (The original release was on a 78; it seems to have been reissued, as a 45, in 1952. RPI (Raydar Productions, Inc., Butler, Pennsylvania) as "Jim Nabbie"
QCA (Cincinnati) as "Jim Nabbie"